When I received my dance name from my main teacher that started me on this journey to become a belly dancer and start dancing live on stages, I didn’t know just how much my name would get passed on. My name Sohaila, means “A Star in the Sky”. Thru the years teaching I felt the need to start a dance troupe. When I was finding a name for my new troupe I didn’t have to look far. Since these beautiful dancers were stars I felt it appropriate to use my name in it, thus the Sohaila’s Shining Stars were born in 2003! I have gone thru many dance students through out the years coming and going but one thing remains a fact, once a Shining Star, always a Shining Star. BRIGITTE loves to dance. When Brigitte isn’t dancing she balances a busy career in an international law firm and has found that her love of bellydance and troupe life fits right into her busy schedule. Sohaila’s Shining Stars get quite a reception wherever they go and have been featured on the news several times. Brigitte loves to bring the joy of middle eastern dance into peoples lives. Cherry had studied ballet, jazz, modern, and hip hop and obtained a B.A. in Dance from UCSD. In 2010, when she saw a bellydance class offered at her local gym, she was excited to try it out and has been hooked ever since. Cherry even danced with Sohaila’s Shining Stars while pregnant in 2011. Cherry has enjoyed learning from Sohaila so much, she became a certified trainer in Sohaila’s bellydance fitness format, NewVo. Cherry also enjoys watching Sohaila’s collection of retro videos of her dancing in the Middle East (available on Sohaila’s online hub). In short, she is a big fan and has been honored to study under a teacher who has broken down teaching bellydance to nearly a science. Today, Cherry continues being a happy student and dabbles in solo choreography, which is still out of her comfort zone. 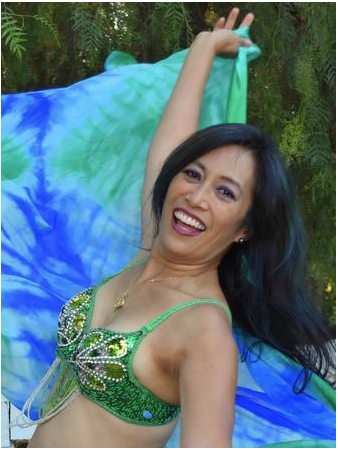 Kristine started with one of Sohaila’s belly dance classes in 2012. I wanted to take belly dancing, because I am half middle eastern and was interested in learning it. I loved it and found it challenging. I taught aerobics for 8 years, and this was so different from anything I had ever done. I fell in love with it and with Sohaila’s choreography. I could not wait till the next class. I have a busy career with Neutrogena, and I travel often but I can’t wait for my Wednesday class every week. I have been a Shining Star for about 4 years now, and my favorite part of Belly dancing is performing with our group. It is so fun and I can’t stop smiling. Sohaila is so talented and makes class and our choreography always fun. I can’t wait till our next performance! Joyce has been dancing with the Shining Stars for about 15 years, making her the most long term dancer. She originally started belly dance for the exercise, but eventually began to perform too. She loves the camaraderie of her group of sister-dancers. When not dancing Joyce is a nurse practitioner in women’s-health. 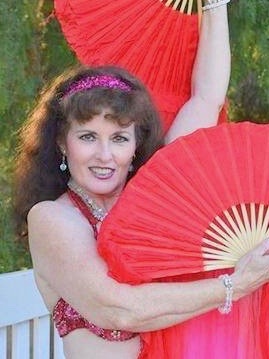 Tammy With no formal training in dance except experience in International Folk Dance as a hobby and a love for Greek music, at age 19 Tammy signed up for a belly dance class through Ventura Parks and Rec. She pursued belly dance classes intermittently for 3 years in Ventura, LA, San Fernando Valley, and San Diego during college and grad school, trying to squeeze it all in between a heavy academic load and being a manager for the UCLA men’s basketball team. A now fond memory includes dancing one time at a small local (fortunately pretty empty) restaurant with very shaky nerves and knees (which hopefully helped her shimmy!). She then took a 30-year hiatus to attend medical school, residency, have 3 kids, and practice Family Medicine for decades. 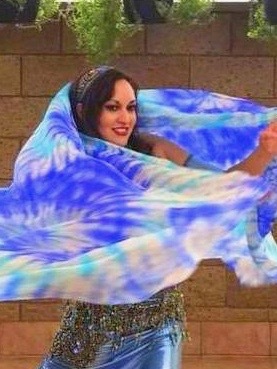 In 2004, she tried belly dance again, and signed up for Sohaila’s intermediate summer class through Poway Adult School. While that intermediate class was pretty overwhelming after that many years, she was entranced by the fun the ladies seemed to be having in Sohaila’s beginning class. she kept returning to that image in her mind, and eventually returned to Sohaila’s class at the beginner level in the fall of 2010. That was all it took. By 2nd quarter she was attending both beginning and intermediate classes and by the next summer, she had started to attend Sohaila’s studio classes as well (technique at 7 and choreography at 8). Her first performance with Sohaila’s Shining Stars was on her 54th birthday in the fall of 2011. She’s been hooked ever since, reaping benefits of health and friendship, confidence, creativity, and even knowing how to fall better without getting injured…all to Sohaila’s classes! Tammy continued taking classes and dancing regularly with Sohaila’s troupe through December of 2017 when less than a week after their Christmas Festival, she was diagnosed with Stage 4 Ovarian Cancer, and underwent a 7 hour surgery followed by 8 months of chemotherapy. Despite the disability that remains after chemo and cancer, Tammy was determined to return to dance for the benefits it has on bone density, memory, posture, not to mention the fun and friendship this tribe of Sohaila’s enjoys. Tammy started coming to sit and watch classes in May 2018. She is happy to report that while she continues to be disabled in terms of stamina, many weeks she is now up to coming to class and has been gradually able to start to perform with the troupe by pacing herself (and knowing that most of the audience’s eyes are on the youngsters). Tammy says that Sohaila’s classes have been wonderful because of the emphasis on fundamentals, repetition to gain mastery, learning really beautiful choreography that Sohaila creates, but also having been encouraged to take the combinations Sohaila has taught and turn them into our own choreography. The class and the troupe has been an atmosphere that fosters creative growth and welcomes new members in a safe environment and a great studio. Tammy is currently the oldest member of the troupe at 61 and would like to keep going another 10 years if possible. Tammy likes to organize things, charts, communications, etc, and has thus earned 2 nicknames from the other girls: Mama Tammy, and Bossy Pants. Tammy has a special place in her heart for all the ladies in this troupe including Sohaila for their tremendous support of her during her cancer and treatment and welcoming her back afterwards with so much encouragement.